Acne | Health Articles | What causes acne? This article has been viewed 5296 times. Are you one of the many that suffer from acne? There are various different reasons for why we can “breakout” or simply why we may have constant pimples or raised bumps that can be embarrassing and hard to hide. Believe or not there are some very simple day to day changes that we can do to help or even eliminate acne for good. Firstly, we need to grasp how acne develops and once we understand that we can do certain things to even prevent it from happening. Acne develops when an oily substance that lubricates your hair and skin (sebum) plugs the hair follicles. Bacteria can trigger inflammation and infection. Also hormones can be a very big contributor of acne, these hormones are known as androgens that increase in boys and girls during puberty. 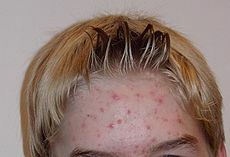 But adults who may take medications that have hormones in can definitely create the cause to acne also. Another big cause of acne can simply be our diet. Processed foods or foods rich in sugar can trigger acne. Even certain foods that we may have allergies to can cause our body to react with skin irritations. It is important that we look after our skin and be as healthy as possible and even getting enough sleep can help prevent acne or help acne heal. Pimples, zits and other forms of acne can leave scars, but there are many way to try help prevent acne before it even gets to that point. Let’s hope if we try to do these simple things we can free our skin from the stress of acne. Are you one of the many that suffer from acne? There are various different reasons for why we can �breakout� or simply why we may have constant pimples or raised bumps that can be embarrassing and hard to hide. Believe or not there are some very simple day to day changes that we can do to help or even eliminate acne for good.